After months of design work and integrating a special system into the site, it's finally completed. Though, is anything ever truly done? I know the header is going to be replaced in a few days once I get the new header design back from the graphics firm. And there are some cosmetic changes I'll be making to the body of the site here and there. So, I suppose it's never done, but at least it's up and has officially replaced the old site which was more of a place holder than anything. 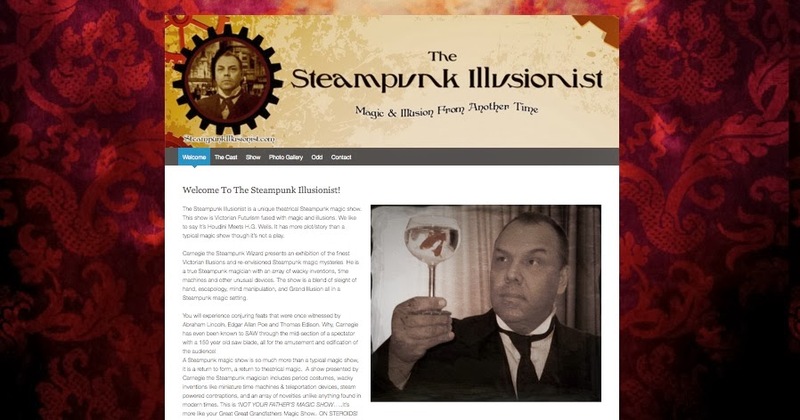 We have been scheduling shows for the Steampunk Illusionist for a while. From the start the shows were going to be a three part project. Step 1 was to design a simple show I could take out on my own. Step 2 was to design a two person show complete with at least one big illusion. Step 3 is a much grander project, which is a show which is part play, part magic show. Step 3 has not been accomplished as of yet, we are still writing that show. But the Steampunk Illusionist will still be out there doing shows, making appearances and traveling back and forth in time (part of the show concept).